NHAI Recruitment 2017 has announced for 70 Young Professional (Technical) Posts. Want to know all details? here we have updated some information such as rocess of examinations and interview, eligibility criteria, Offline registration processes, payment of prescribed application fee/intimation charges, NHAI pattern of examination, NHAI Syllabus, NHAI Question Paper, NHAI Walk in Date, NHAI Result Date. Now check below all details. Experience Preferable: Candidates possessing experience in Infrastructure & Road Sector preferred. Age limit range: Age Limit Should not exceed 32 Years. Candidates Relaxation in Upper Age limit will be provided as per Govt. Rules. 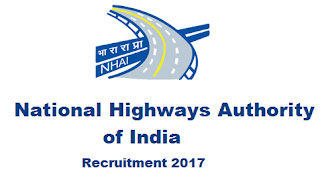 Applicant should get or Download and read NHAI Job notification to get aware of recruitment schedule and venue from official website www.nhai.org. Candidate must reach advertised venue (Address & Walk in Date Mentioned in Official Notification) with all original document and Xerox copies, filled in application form (if required).